Red versus Blue. Shirts versus skins. Zombies versus humans. These are all surface level distinctions, saying nothing meaningful about one team's likelihood of trouncing the other...right? If only there was some way to quantify the results of many different matches of a particular game and then use this information to come to a conclusion. Big data to the rescue! 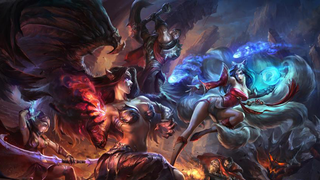 In a report published this morning, The Daily Dot tracked well over two hundred matches of League of Legends to see if playing on team Blue or Red gives players a better chance of winning. The results were surprising, to say the least. "In over 224 games, the Blue side team won 34 times more than the Red side," author Ferguson Mitchell wrote. "At 129 wins, that's a 30 percent difference between the opposing sides." Blue teams also won nearly a third of games against Red teams that were ranked above them, the report goes on to say. And, perhaps less surprisingly, Blue teams won a lot more games played against teams ranked below them compared to Red teams in the same situation. "These kinds of statistics speak to the depth of strength that the Blue side has," The Daily Dot concludes. "Despite being matched up against better teams, teams playing for Blue actually have a leg up—they win more often against better teams than the Red side." This has been a rich topic of debate in the League of Legends community ever since Riot Games first launched the enormously popular competitive online game back in 2009. Some diehard LoL fans argue that team Blue gets an unfair leg up in the competition because they get first pick of hero characters to play with and which to remove from the roster. Others counter that team Red actually has the advantage because two players get to pick from the roster simultaneously. And so the age-old dodgeball draft from middle school continues. My League-playing friend and The Daily Dot both answer the question in terms of a number of mechanics-based factors that influence gameplay and competition—who gets to choose when, how meaningful these choices can be, etc. But another way to look at this might have something to do with the behavioral studies that Riot Games have been conducting within League of Legends as the game has continued to grow in popularity. One interesting finding was that showing a red message about negative behavior during the loading screen lead to a much larger decrease in toxic behaviors (in terms of attitude displays, abuse, and offensive language) than did the exact same message in a white font. Additionally, showing a blue message about positive, cooperative behavior during the loading screen also lead to a decrease in a negative behavior, while no effect was observed for the same message in white. And, interestingly, when the question "Who will be the most sportsmanlike?" (a positive behavior message) was presented in red, the toxic behavior metrics actually all increased. Could the very color a team is assigned have an influence on their chances of winning a game, regardless of when they get to draft heroes? Another League of Legends vet I spoke to for this story dismissed the thought, saying that Lin was only talking about "the color of the text" when it came to altering player behaviors—a pretty small factor compared to the overall structure of the blue and red teams. But still, Lin's point about priming in his GDC talk was meant to illustrate just how big an effect seemingly tiny details can have on the overall ecosystem of League of Legends. "Maybe there is something there," the doubtful League player responded when I pointed this out to him. I've reached out to Riot Games, and Lin specifically, to hear their thoughts on the Red versus Blue debate. I'll update this story once I hear back.